The Lake Tahoe Historical Society Museum is located at 3058 Hwy 50, South Lake Tahoe, in the middle of South Lake Tahoe. 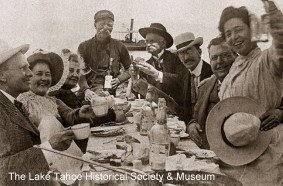 Lake Tahoe Historical Society Museum features an outstanding collection of artifacts from Lake Tahoe’s earliest days. Come get a complete look at the Lake Tahoe’s area history. Visit an authentic toll booth built in 1859 that was located at the base of Echo Summit. Walk-through and look at an authentic 1930’s summer cabin, and view a chronological exhibit of artifacts from Lake Tahoe’s early days to present. Hours Memorial Day thru Labor Day: 11:00 am – 4:00 pm 7 days a week. September thru Memorial Day: Saturdays & Sunday’s only 12:00 noon – 4:00 pm.